These traditional German drinking vessels liven up any beverage. 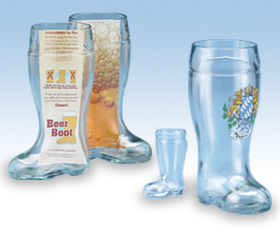 To drink from the boot without mishap, turn the toe of the boot so that it points to the side and enjoy! We have boots available in various sizes, materials and themes. Want to decorate a boot with your own design? Just click on the Custom Boots link to visit our custom products website or give us a call.